REDUCED!! 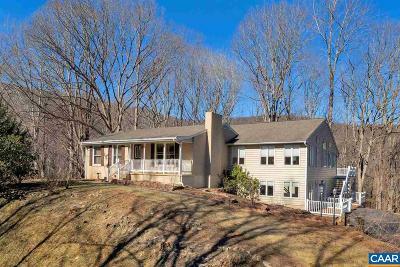 In the heart of Nelson 151 this 31 acre multi-use & dividable property basks in Blue Ridge Mountain views! The 3 bedroom, 3 bath main home was extensively renovated, now featuring hardwood floors, custom kitchen, dual family rooms, huge workshop, 2 fireplaces, deck w/screen porch & whole house generator. Additional 1400sqft modular 3 bedroom 2 bath home freshly painted with new appliances, flooring, kitchen cabinets/granite. Perfect for rental or airbnb. The property features 4 additional outbuildings for work, hobby or studio space. A stunning bold creek runs 1400'+/- through the property. Minutes to Wintergreen skiing/golf, wineries, breweries, cidery, distillery, etc. Convenient to Charlottesville, UVA, & the Shen. Valley.